Last week, I ate a bowl of the best clam chowder I’ve encountered thus far in my life. Walking off my food baby, I stumbled upon an electronic palm reader, which ominously told me to seek help. After some serious soul searching, my help came to me in the form of a realization about picky eating. I remember when I would do just about anything to escape eating most foods. Napkins make great hiding spots, and slyly sliding asparagus to the dog is a classic picky eater power play. This is a story about the time I didn’t use a napkin or my dog, and how a bowl of clam chowder saved me from a lifetime of being doomed to picky eater-hood. The line of the beach town diner wound past the front windows and bent around the corner to reach back into the side ally. The chitter-chatter of anxious foodies talking about the clam chowder filled the air thick as the ocean’s scent. The line began to move and I was one step closer to swimming my taste buds in what would be my very first bowl of clam chowder. I was in the door way. 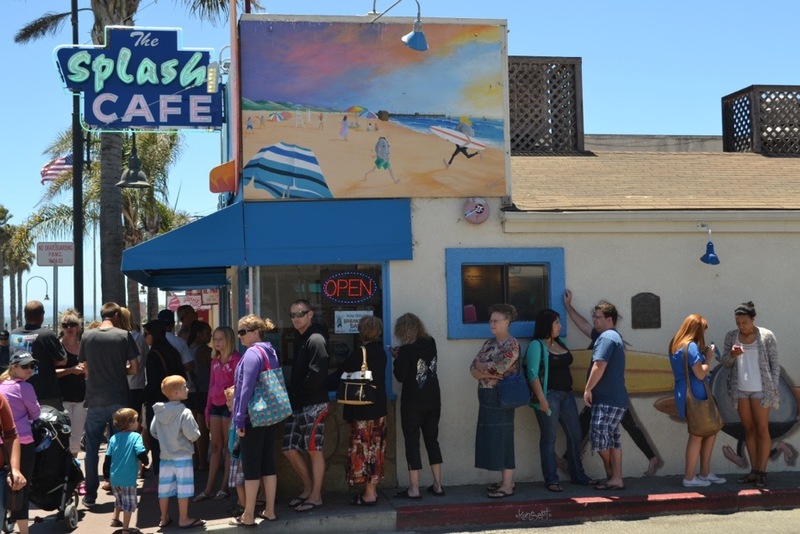 The Splash Cafe was in high tide with beach goers. There wasn’t even space for the sound of waves in the joint and the fresh bread bowls filled with clam chowder were all I could smell and see and think. I was next in line. “I’ve never had clam chowder.” I said to the cashier. Drowning under the swell of customers she flashed me an “Are you serious?” glare. It was kind of like the stink eye but with less stink and heightened disbelief. It’s not like I said I’ve never ridden a bike or read Harry Potter. Tons of people have never tried clam chowder, I’m not the only picky eater. Right? My order was taken, one bread bowl of the best clam chowder please, and then I waited. At the age of 20 I would have my first bowl of clam chowder and my picky taste buds were to blame. What if I like clam chowder? I thought. What if I REALLY like clam chowder? And what if there are millions of other unsuspectingly delicious meals waiting to show me the light? Pessimism also invaded my thoughts: What if I don’t like it? Then, I heard it: “Green Lantern!”. (my favorite name to give at restaurants) My order was ready. Hesitantly, I reached towards my spoon. It dragged through the sloppy mixture as I played with the chunks of shellfish that floated in the creamy slop that was my lunch. Then, when I was ready, I placed a carefully measured spoonful gently on my tongue… Then another. My petite spoonfuls turned into entire servings. Then another. There was clam chowder coating my face. And another, until I’d finished it all and the bread bowl was the only survivor. I ate that too. The combination of traveling, new foods and palm readings lead me to my picky eater revelation: Seek Help, embrace the uncomfortable and Try New Things. Eating new foods, although a small and temporary action, can take just as much courage as jumping out of a plane and praying your parachute will open before you meet the earth, or, leaving behind friends, family, jobs, everything, to travel the world. Trying new activities and visiting new places are two things I love. Trying new foods is just as important for the travel experience as the people and attractions. A bowl of clam chowder was the help I needed to begin facing my food fears and more; trying things I don’t desire to taste, see, feel, hear, smell, or do. Because you will never know if you like it until you try it. With a full stomach and chowder inhabited mustache I left Splash Cafe with a new mindset on picky eating. For dessert, my friend insisted on lollipops with scorpions in them from the candy boutique down the street. I got ice cream… There are some things I just don’t need to try. This entry was posted in Uncategorized and tagged Food, Picky Eating, Pismo Beach, Splash Cafe, travel, Travel Writing, Writing. Bookmark the permalink. Great blog! I can’t believe you up and moved liked that! Now that I’m following you I look forward to seeing your adventure unfold. If you are in to outdoor sports or incredible views check out my latest post!